Want to know where the most contentious US House, US Senate, and Governors races are this November? Check out Google’s 2010 US Election Rations map mash-up which includes data from CQ Politics, Rothenberg Political Report, and other sources with a daily to weekly update. 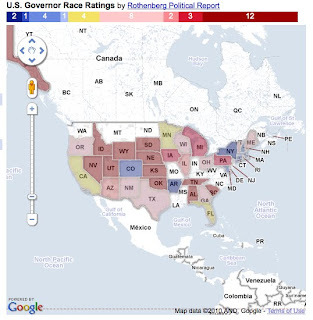 With this tool you can look at national and state level polling trends. Check out this Interactive Map!